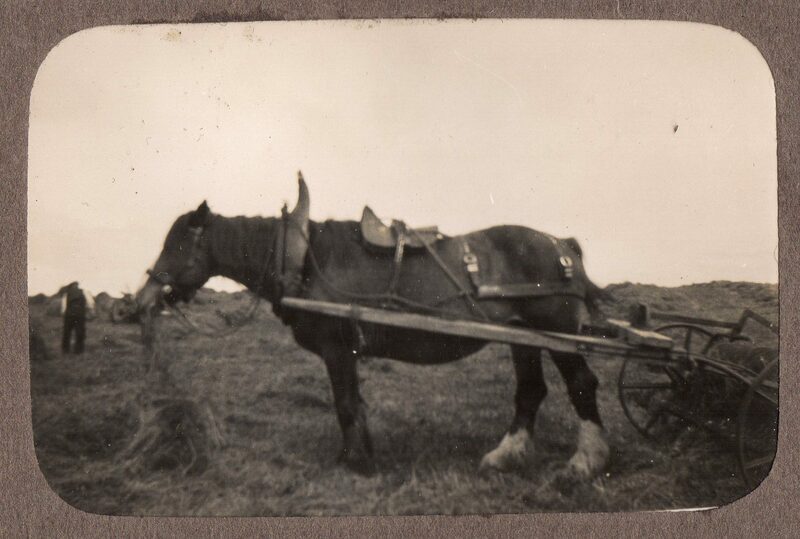 Black & white photograph of a horse harnessed to a hay turner at Clachan in the 1930s. 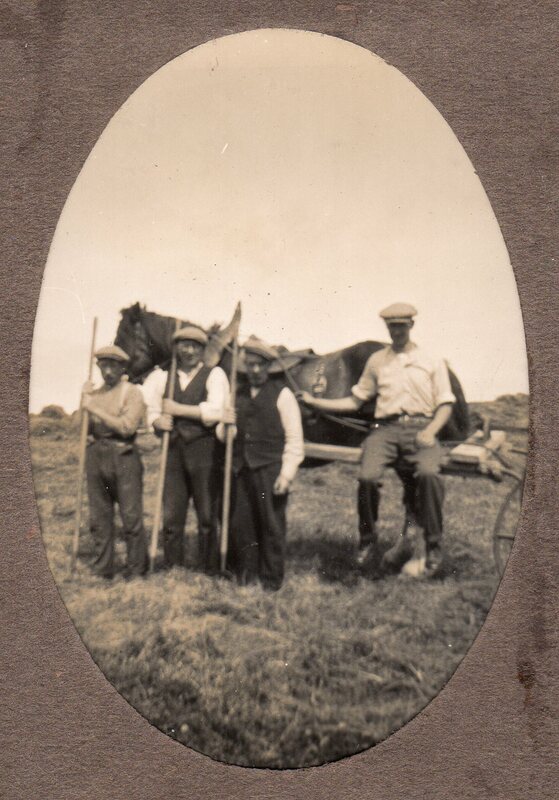 Black & white photograph of four (unidentified) men haymaking at Clachan in the 1930s. Small clear glass rectangular ‘Sloans Liniment’ bottle found on Soroby Beach. 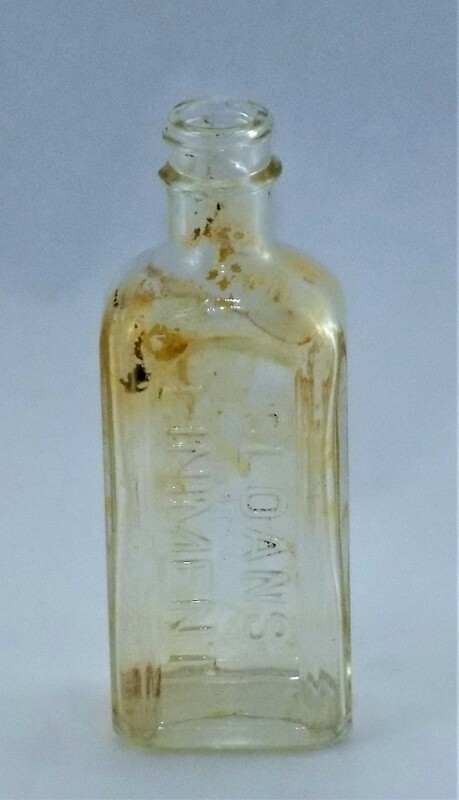 Sloans liniment was made between 1890 and 1913 for applying to the skin to ease muscle and joint pain. 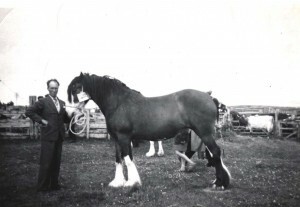 Initially made for treating horses, but was found affective on people also. 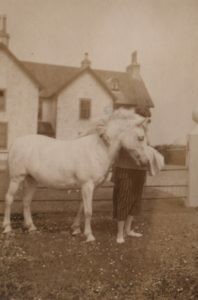 Black & white photograph of Babs on Norah the pony in the 1920s. 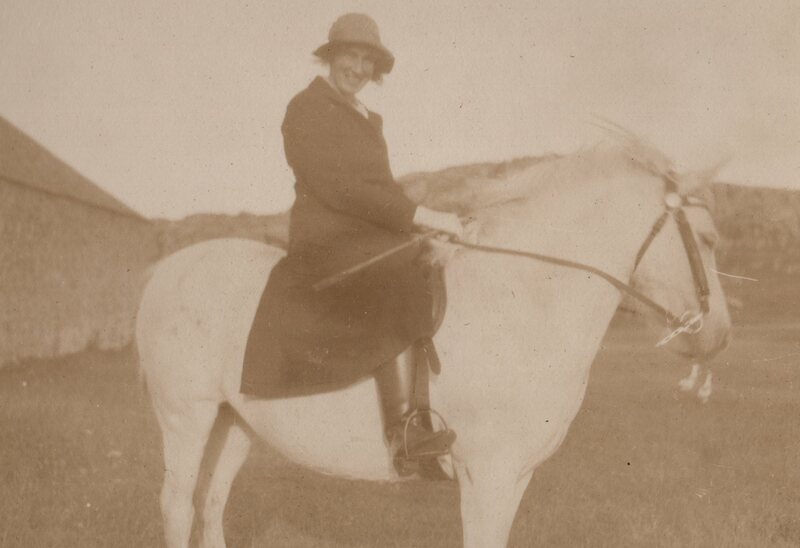 From a large photo album embossed with G.I.B. 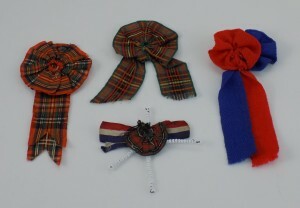 and belonging to George Ian MacLean Brodie, who was the grand-daughter of Lachlan MacLean (b. 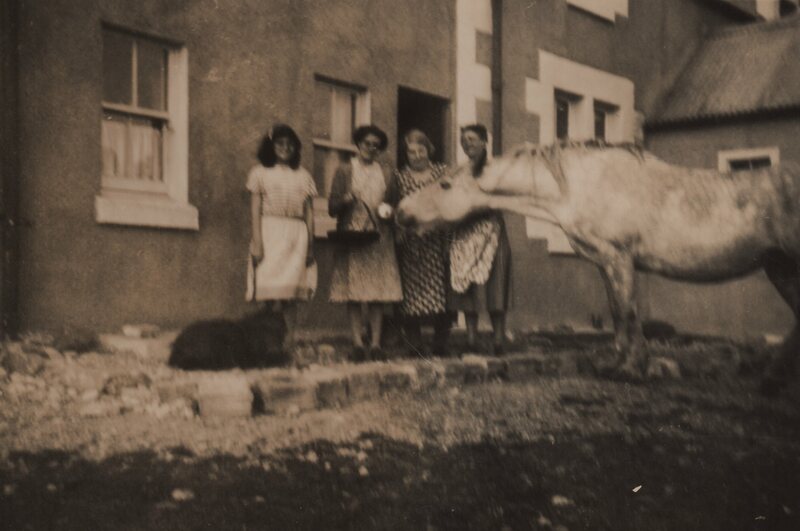 1804), Kilmoluaig, and Catherine MacLean (b.1814), Grianal (Greenhill). Black & white photograph of (L-R) Norah the pony and Babs at Island House in the 1920s. From a large photo album embossed with G.I.B. 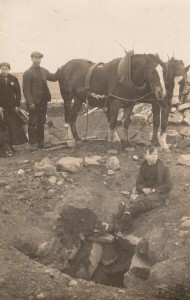 and belonging to George Ian MacLean Brodie, who was the grand-daughter of Lachlan MacLean (b. 1804), Kilmoluaig, and Catherine MacLean (b.1814), Grianal (Greenhill). 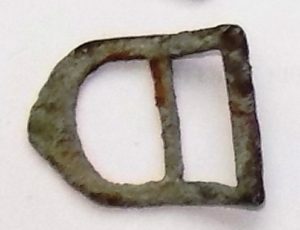 Medieval buckle off a horse’s harness from a collection of around 200 bronze objects found by amateur archaeologist George Holleyman at Balevullin in 1941-43, when he served at RAF Tiree during WWII. 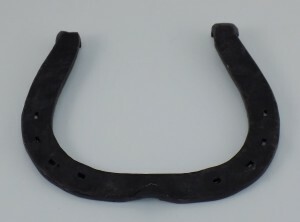 Identified by Dr Colleen Batey, Senior Lecturer in Archaeology at Glasgow University and David Caldwell, retired Keeper of Medieval Department at the National Museum of Scotland during a visit to An Iodhlann on 29th April 2016. 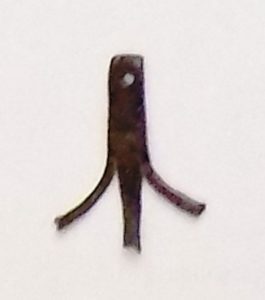 Medieval bronze spur, worn on a horseman’s boot, from a collection of around 200 bronze objects found by amateur archaeologist George Holleyman at Balevullin in 1941-43, when he served at RAF Tiree during WWII. Identified by Dr Colleen Batey, Senior Lecturer in Archaeology at Glasgow University and David Caldwell, retired Keeper of Medieval Department at the National Museum of Scotland during a visit to An Iodhlann on 29th April 2016. 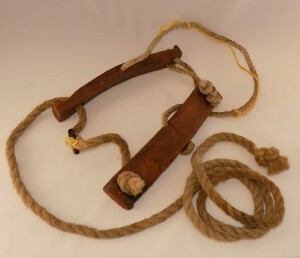 Three large brass buckles from a horse-harness, one on a section of leather strap. From Kirkapol Farm. 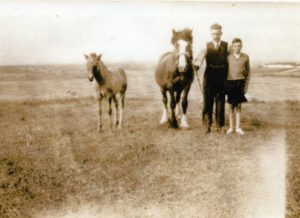 Black & white photograph of L-R: Angus MacArthur and Murdoch Sinclair leading a mare with her foal at Balephuil around 1950. Black & white photograph of four women of the Kennedy/MacCallum family of Balevullin standing outside a house with a grey horse, around the 1930s.